Oooops! Don’t Thin the Chard! | EAT MY PLANTS! First, a garden update and some pics to show how everything is coming in. I mentioned in an earlier post that if I remember to get enough pics from the same vantage points, I can do a time lapse at the end of the season. 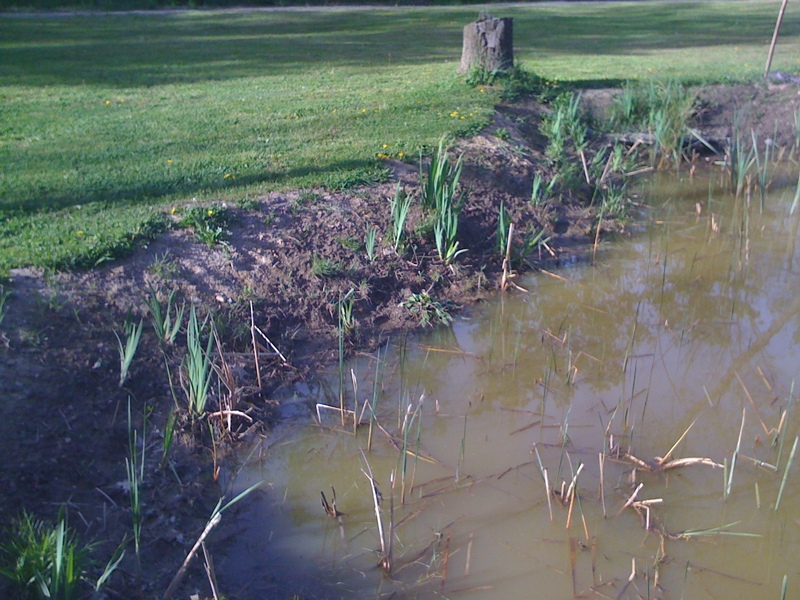 Here are a few of those shots including the Iris in the pond. Here’s a shot from that same North corner. I love that the Day Lily are coming in so thick. 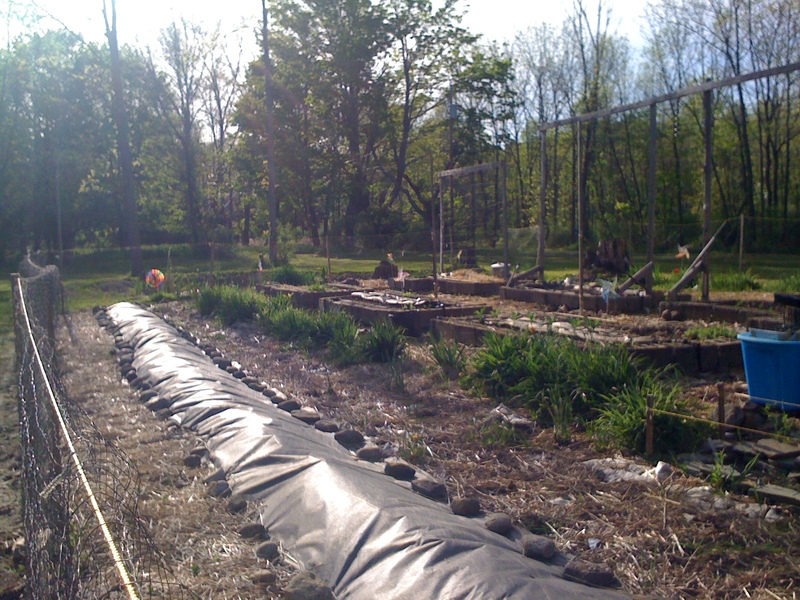 The row that is covered will be getting uncovered to make room for Kale as well as Summer Squash and Zucchini. I still don’t know where I’ll put the Winter Squash and Pumpkins. Also from the same North Corner. That color wheel that spins in the wind seems to be assisting in keeping the critters away from the garden. That and there’s a net that goes around the entire area, a wind chime, a couple whirligigs, and some random slices of Irish Spring. So far the deer don’t care much for the smell of a freshly showered farmer. A friend mentioned the use of Milorganite and I read a few papers on it. Since I everything I do here is very organic, and even the fringe organics don’t make the cut, I’ve still got some research to do on it. In short, it’s a descendent of human waste after being treated. I’ll keep it at that for now as I still have to dig up some more about this fertilizer. 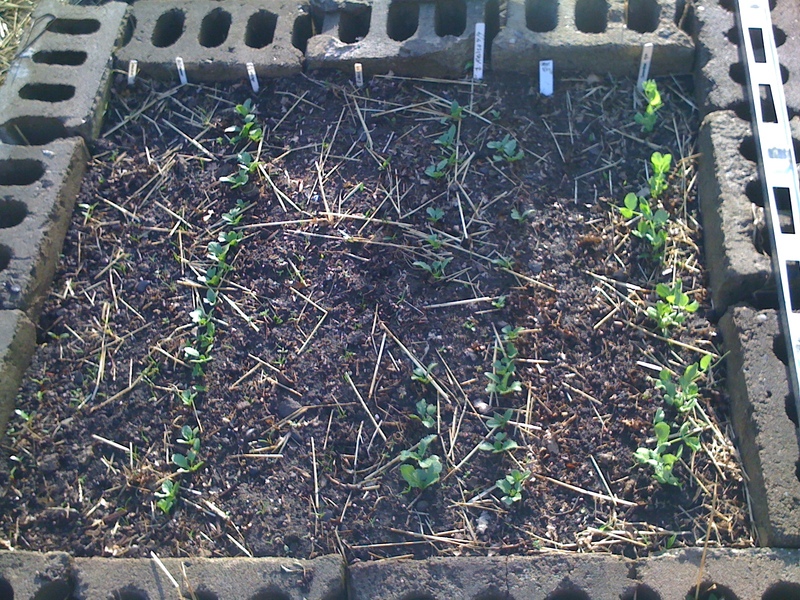 In the bed nearest in this picture are 5 Broccoli and a few Snow Peas. I have yet to decide what else is going in this bed. It might be Melons or Cucumbers. The Catails are coming in. So far they don’t appear to be overbearing. 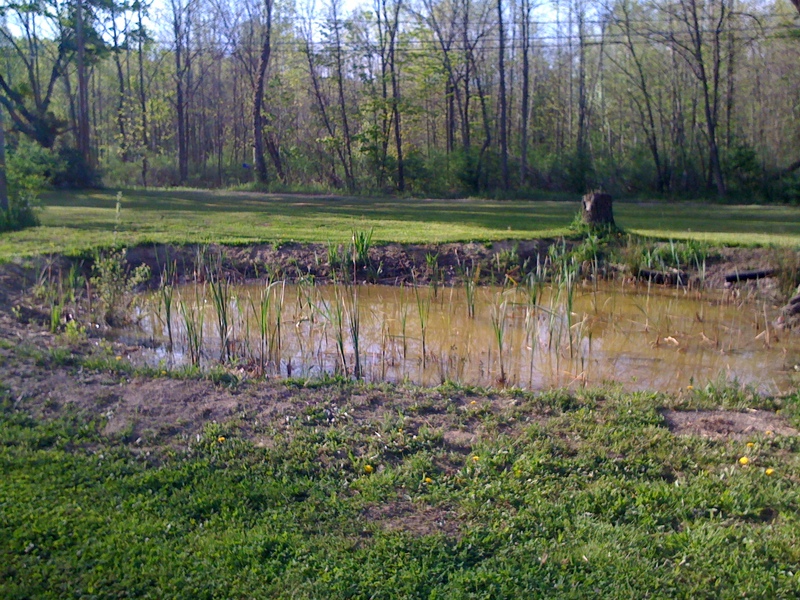 The Iris, however, are coming in quite nicely around the pond. If you look closely at the bottom left of this picture, you can see a HUGE frog sunbathing. This pond has so many of them and they’ve gotten used to me being around so I can get really close to them because they know I won’t mess with them. In the late Summer when my Sunflowers are seeded, the birds are the same way. At first they easily spook but a week later I can walk around them, just a couple feet away, and they keep munching because they realize I don’t mess with them. It’s really one of the coolest things. I feel a little connection with them at that point. Check out the Iris. 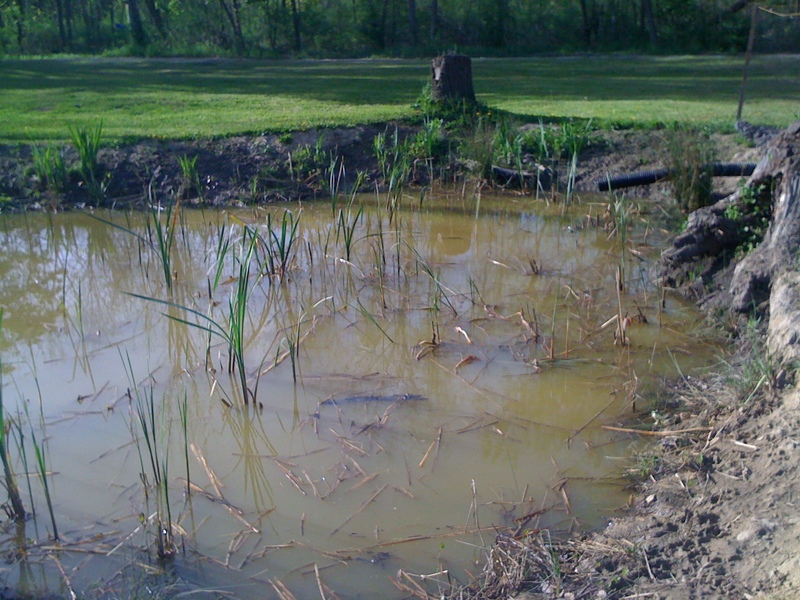 The last time I took posted pics of the pond, the Iris were still under the water line. It’s receded quite a bit. WNY is well under the typical wetness already. Local farms that have done soil samples are saying the fields are drier than last year. The local marina, Lake Erie, is very shallow. The lake is lower than average. It’s a little concerning. 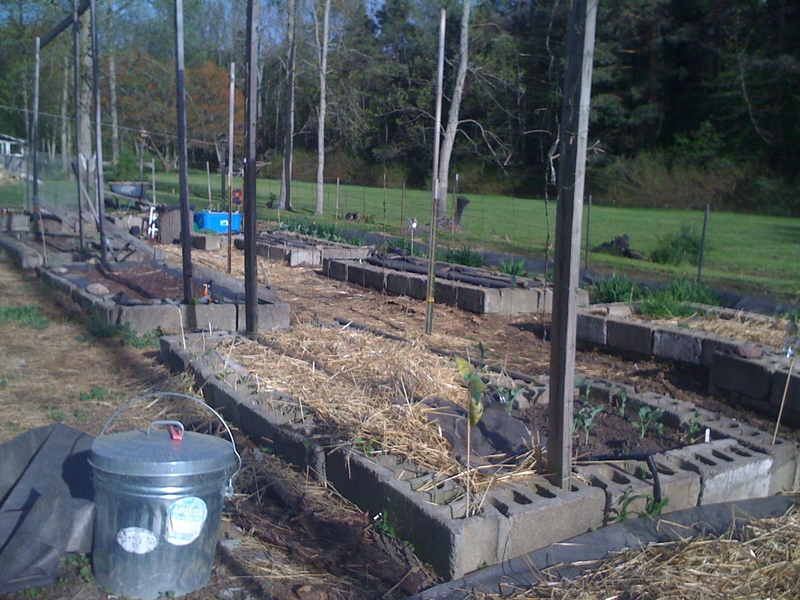 Local farms have already started using irrigation. Not cool. Here’s on of the square beds again. We can easily see everything coming in now. 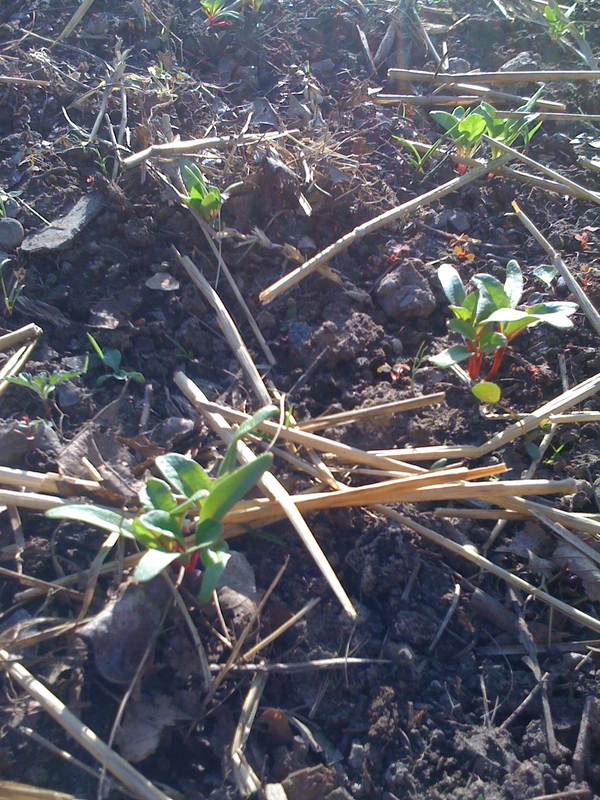 Swiss Chard, Spinach, Carrots, Radish, and Snow Peas. 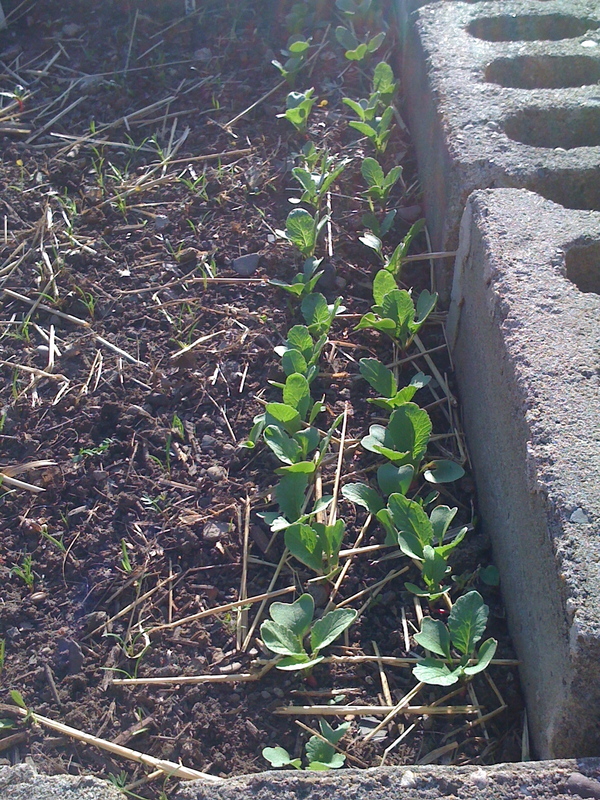 The Radishes are looking nice. They’re very strong. 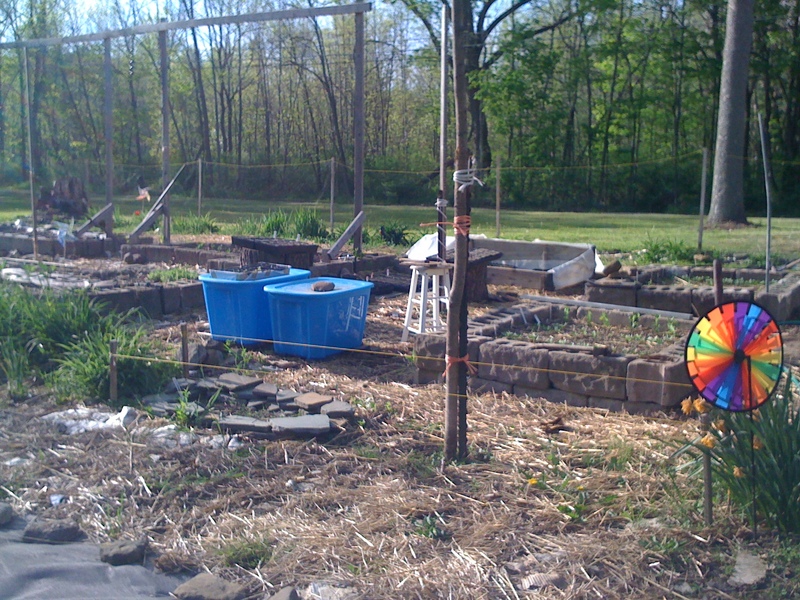 Ok, so remember this blog is about the success and failures of a musician gardener. 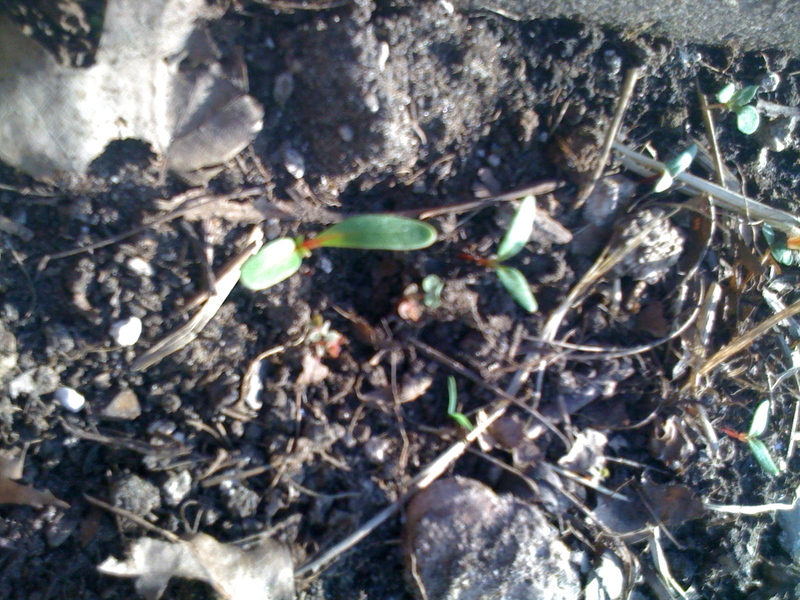 Here’s another one of the failures… I noticed that the Swiss Chard was coming up in twos and threes. So I thinned them down to singles. 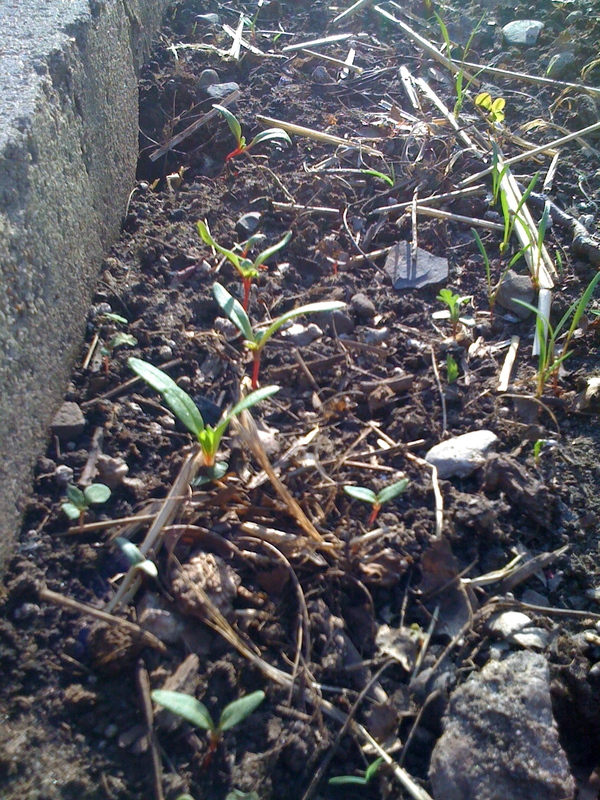 I have grown Swiss Chard two seasons now and that’s why this is such a stupid blunder. Notice I thinned the entire row. Oops. I had thought about the seeds and how large they were. I was certain I hadn’t double and triple planted every one of these. It dawned on me as I thought back about my previous Swiss Chard and Rainbow Swiss Chard, that it grows in groups. So I quickly ran into the house and checked my resources. Indeed, it grows in groups. Doh! Luckily, I didn’t thin both beds before realizing I was an idiot. I’m curious how the thinned Swiss Chard is going to do. I can do another planting and have more Swiss Chard a couple weeks later now. 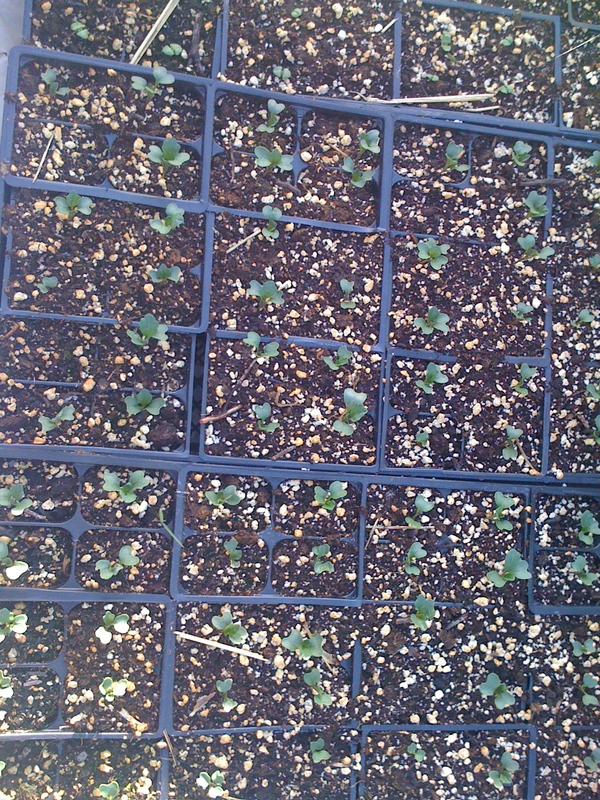 95 of the 96 cells with Kale seeds have emerged and are looking great. For a month now we’ve had Kale every morning along with other fruits and veggies all juiced up in a Breville. Kale is a superfood and I can definitely say I feel very energized after a tall one of those juices. 95 of these are a lot of Kale plants and I know I can’t put them all in the garden. I might have to find some other homes at friend’s gardens and random spots on the property. Here are the newest Tulips. 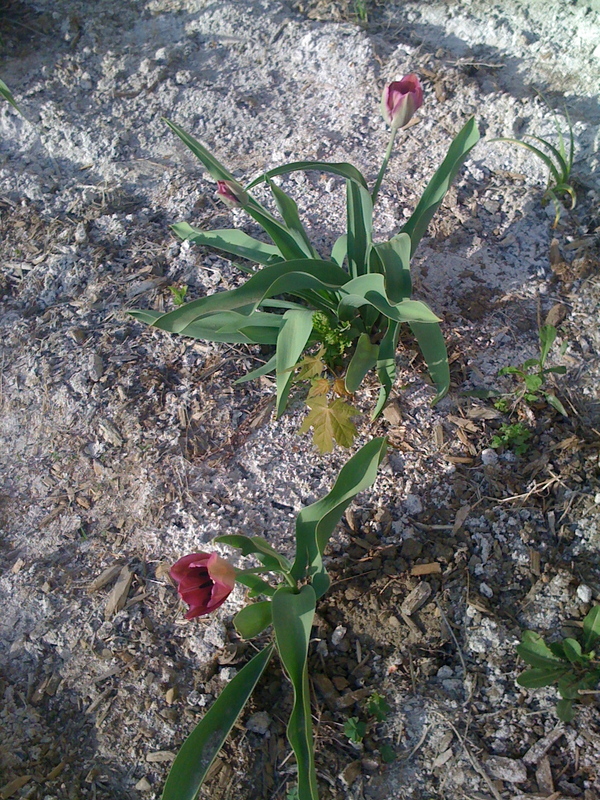 These are growing in a side bed next to the house near Day Lily and Iris. There’s a lot of ash in this bed from the wood burning stove over Winter. I still have to cut in some organics and leaves and whatever else I can muster. This bed was mostly sand and stone last season. Luckily Iris and Lily grow in anything but I was surprised the new Tulips came up. That Napa Cabbage was delicious in our salads and on our grilled chicken sandwiches. It wasn’t anything like Cabbage flavor since it was so young. Not bitter, not tough. Was very appropriate for salads and on the sandwich. Sadly, I won’t have any more of these until Fall.